Laser technology has greatly advanced in recent years, and our eye surgeon is proud to offer all-laser, blade-free LASIK surgery. Although patients remain awake for the duration of LASIK vision correction, it is considered a virtually painless procedure due to numbing eye drops which are administered before treatment. While creating the corneal flap with the laser, a small suction device is used that may cause a brief sensation of mild pressure. As the cornea is reshaped with the laser, patients typically do not notice any feeling at all. LASIK surgery patients usually describe the experience of the procedure as slightly awkward, but not uncomfortable. The entire procedure is also quick, requiring only a few minutes per eye to complete. 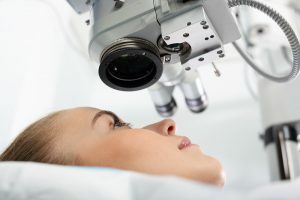 After LASIK surgery, once the local anesthetic has worn off, some patients report mild discomfort. However, over-the-counter pain medication can be used to easily manage this side effect. Within a few hours, most patients say their eyes feel like normal again and begin to enjoy clearer vision. For more information about how Riverside EyeCare Professionals prioritizes your safety and comfort, please contact a member of our staff or schedule a consultation today.